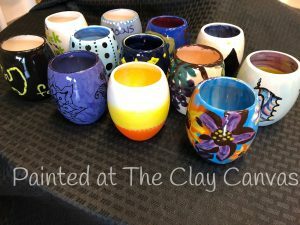 The Clay Canvas is Reno’s original Paint Your Own Pottery Studio, and has been bringing affordable and artistic fun to Northern Nevada for over 20 years! With a large variety of pieces available for you to choose from and more than 80 paint colors and specialty glazes to use the possibilities are endless! We regularly order new and seasonal items, so each visit offers potential for new creativity. The Clay Canvas offers creative recreational fun for people of all ages and creative abilities. You do not need any experience or minimum skill level to create an amazing and unique ceramic piece. We are a great place for a family fun day, a girls evening out, or a date night. You are always welcome to bring in your own food and drink. You bring your sense of creativity, and we will provide the rest!